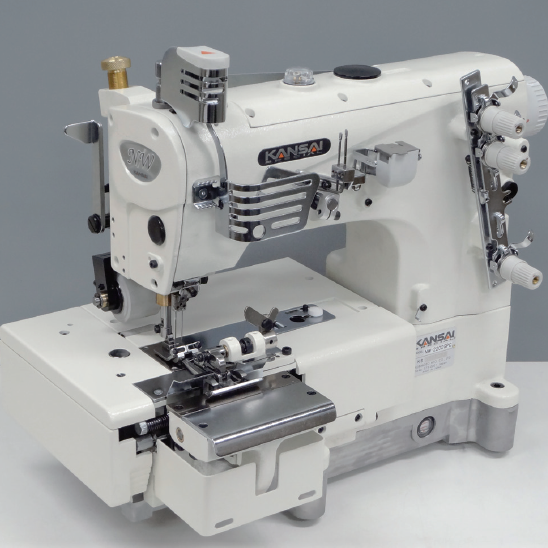 NW2202 series is a flatbed, 2 needle, bottom cover stitch machine for belt loop making with front knives. This machine is a successer of “B2000C”. The machine’s features are as follows. ① The support (front) presser foot is independent against the main presser foot, so it is easy to remove, and it has a stoper to keep the lifted position. Therefore, it is easy to insert the fabric when starting the operation. ② Equipped with adjusting dials, both spring pressure of right and left lower knives can be equally adjusted. ③ Adjusting knob enables the machine to produce belt-loop from 8mm up to 20mm. ＊For the width over 16mm, the special wide needle plate and feed dogs are needed.